I am constantly in awe at how quickly information pings around us these days. In a nanosecond we have news from the other side of the planet. Photos, music, documents and of course, recipes are at our fingertips in a heartbeat. My dear grandma, who painstakingly hand-wrote recipe cards and snail-mailed them to her friends, wouldn’t recognize our world of lightening speed transmissions on the information super-highway…but I digress! This recipe came to my kitchen in pure 21st century fashion – in a text message. My friend, Maria, who was over for dinner one evening, described to me some delicious and completely healthy chocolates she had tried a few days previously. Of course I asked for the recipe and within 5 minutes (really), we were making the chocolates in my kitchen! Maria texted her niece, who was at a Canucks game, who texted Domenic, who originally made the chocolates, who texted back the niece, who texted back Maria… whereupon we had the recipe in our hands to create!! The beauty of this recipe is that it only takes two ingredients and is, according to current nutritional research, extremely healthy for us!! Yeahh! Sweets that are healthy! Pure, organic cocoa powder is rich in antioxidants and will help your body fight free radicals that cause the body harm. And according to Bruce Fife, C.N., N.D. who wrote The Coconut Oil Miracle, coconut oil is anti-bacterial and anti-viral and will help the body fight a host of diseases and afflictions including Alzheimer’s Disease and some cancers. So thank-you Domenic. I have never met you before, but this is an awesome recipe! And to those of you who enjoy chocolate, it is a new revelation. Here is a recipe for a decadent treat without any guilt attached! In a small saucepan, melt the coconut oil. (It is solid at room temperature. Remove from heat and add the cocoa powder and powdered sugar or stevia if you are using it. Stir until it is a smooth mixture. At this point you may add what pleases you. I made one batch with ½ cup sweetened coconut. I also did one batch with chopped almonds and another with chopped, dried figs. If you prefer, you may add some powdered sugar or stevia for some sweetness. I suggest you taste the mixture and adjust it to your liking. Pour the chocolate mixture into silicone moulds. Place on a level surface in your freezer. Freeze for 20 minutes. Remove from the moulds and enjoy immediately. Store in an airtight container in the refrigerator until just before serving time. 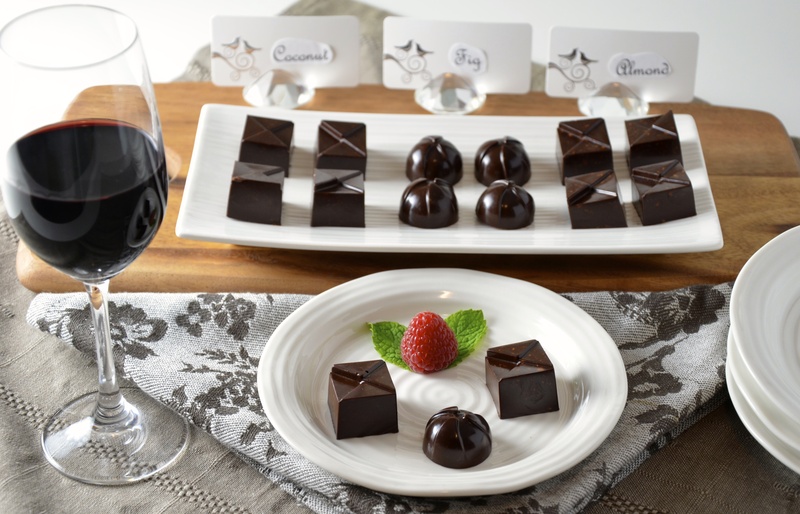 Yield: 10 – 20 chocolates, depending on what you add and the size of your molds. This is so mouth-watering, can’t wait to try. Your photography is such a delight! Well thank-you so much! I do hope you get to try the chocolates. My favourite is with some sweetened coconut. So glad you like the pictures too – I am having so much fun learning about food photography! Cheers! 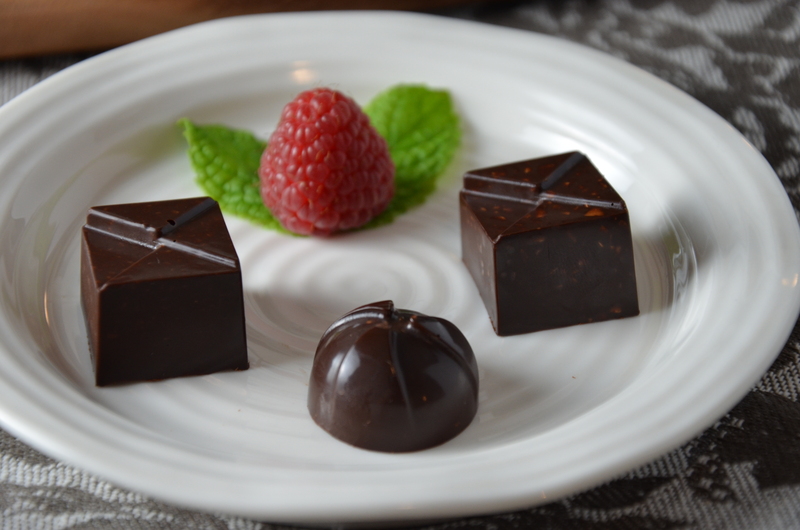 I kept on wondering how you made the chocolates now I see the trick, using moulds….I have to get myself some moulds and try this super easy recipe. It’s so simple yet so elegant. Thanks so much for sharing. I like it that I can add different ingredients to it. Have a lovely week! Hi Lz! Yes, the moulds are so easy to work with and available at most kitchen stores. Just one note, if you like them sweeter, you can also add a bit of powdered sugar with your nuts or fruit. Without sugar or stevia, they may be a bit bitter. I hope you get to try the recipe. Thanks so much for taking the time to comment! I hope you have a great week too! Me too! We have that in common! And Jhuls, thanks so much for visiting my blog! I appreciate it!